Today we are happy to present our newest responsive WordPress Theme Cocoa to you. 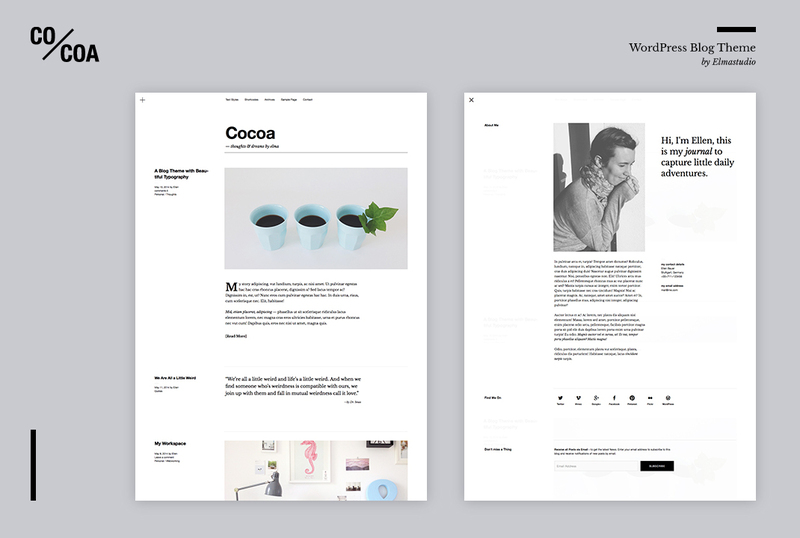 Cocoa is a minimal blog theme with a modern, fresh design and elegant typography options. Therefore Cocoa is a perfect little blog theme for ambitious bloggers and lovers of minimal design and typography. Next to many options for creating beautiful, individual looking post and page layouts you can also nicely present your images in the Cocoa theme, since the theme design is very open and offers lots of white space to show your images in a high-quality and minimal way. A special theme highlight of Cocoa are the two big widget areas in in the header overlay area and the themes footer. The modern header overlay feature offers lots of space for your content, so you can include widgets like the custom Cocoa About widget and let your readers know about little bit more about you and your blog. Cocoa also comes with a beautiful, custom Social Links widget, a big Quote widget and a Recent Post by Category widget (including post thumbnails). Cocoa has a beautiful header overlay widget area, e.g. to include the custom Cocoa About widget. Additionally Cocoa also offers a widget area in the footer, so you can add further widgets below your blog posts. The Quote and Recent Posts by Category widget in the Cocoa theme. To present your content in the most beautiful way, you can use a number of typography layout options in the Cocoa theme. You can include text in the default one- or a two-column layout, add dropcaps, pull quotes, regular quotes, lists, add extra wide content areas or include sidenotes to your pages. You can get an overview of the Cocoa typography options in the Cocoa live demo. You can also use the following WordPress post formats to style your content and be able to publish smaller posts like quotes, status updates or side notes: Quote, Status, Aside, Link, Video, Image. Of course you can also customize the Cocoa theme in the Customizer (under Appearance / Customize) and change your text link color, the background color (under Design / Background) or add your own logo or header image (under Appearance / Header with the maximum width of 1194px). You can also customize the footer credit text under Appearance / Customize / Theme. In order to make Cocoa a really high-quality blog theme we also created a custom Archive page template that you can set up on a new page choosing the “Archive” page template under Page Attributes. So your readers will be able to browser your blog posts easily and find the content they are looking for. We also designed an alternative 3-clumn post layout for search results and archive pages, so that search results will be more clearly presented. We hope you really like our newest Elmastudio theme Cocoa and you are already excited to use Cocoa for your blog or maybe even start a new blog with the Cocoa theme. We are looking forward to your feedback, possible bug reports and your suggestions for theme improvements! i luv it….. ihr seid so toll in der reduktion. grossartig. ich mag ja die serie der letzten drei themes sehr gern…..
so fein und wunderbar klar…. man hat das gefühl, einen leeren tisch zu finden, auf dem man seine eigenensachen draufpacken kann. damit der content wirklich wirkt , braucht er einfach raum. @evarella: Ich glaube ich muss einen Like-Button für Kommentare einführen :) Thank you sooo much, das ist ein geniales Feedback und freut uns riesig!!! Schön schlicht, würde mich jedoch freuen wenn mal was in Magazin Style von Euch kommt. Nette Idee mit dem About Layer, aber ich stimme Silvi zu, ein bisschen Abwechslung wäre nicht schlecht. Macht doch mal ein echtes Premium Theme das gut aussieht, der Trend auf alle Designelemente zu verzichten wird eh vergehen und immer nur weiß sehen ist öde ;-) Für diese minimalistischen Themes gibt es zudem kaum vernünftige Anwendungsfälle. Sieht interessant aus. Ich hab’s gleich mal runtergeladen und probiere ein bisschen rum. Leider finde ich das Social Links Widget nicht, nur ein Social Links Menü. Wenn ich das nutze, sieht es leider trotzdem nicht so aus wie auf der Demo-Seite, es werden auch keine Symbole angezeigt, nur Text. Wie bekomme ich das hin? hier findest du die erste Anleitung für das Social Links Widget, die Doku folgt aber auch in Kürze. I like your design style a lot and this theme looks simply amazing. Very impressed! I want to let you know that we just prepared a small first update for Cocoa, here are the update info details: – Update info Cocoa (version 1.0.1). You can just download the new theme version again using your theme or theme bundle download link. As always, I love it! Nice touches make it a clean and yet modern addition to your collection. Can’t wait to modify it and use it for my new site! thanks you sooo much for your feedback, I’m happy that you like Cocoa as well. Let us know, as soon as you have your site with Cocoa online, we would love to see it! I LOVE this theme! It’s so beautiful right out of the box. Your careful work on the typography really paid off! I am wondering if an email is sent when the author reply to comments, and if not, is there an easy way to do that ? yes, you can add the Jetpack WordPress plugin, it comes with the option to add email subscription for comments and new blog posts. I hope this tip is helpful for you. Thank you, I’ll do that ! Would it be possible to see what this theme would look like with a black bg and white font? I’d like to preview before purchase. Love the design and tempted to buy from WordPress. Does it also support video?